Office Printer Access Management | Which Are The Best Options For You? These days, practically every business needs to keep a close eye on erroneous office expenditures, from excess stationary to water overage. One area many offices could focus more on is office printing – who is printing, how much are they printing, and are they abusing their printing privileges? Excess printing can cost your company hundreds of dollars a year in wasted paper and toner, which can hit your bottom line without you even realising it. So how can you manage access to your printer without impacting your productivity? There are a range of intuitive and time saving security features that can be used to monitor access to your printer. Let’s have a look at some of the latest ways you can manage your printer access. In our increasingly visual and fast paced society, one great method for quick and easy access management is picture login. Picture login involves each authorised user to select an icon that will represent their account on the printer. They will then choose a password that the Administrator will tie to their chosen icon. Now, whenever they go to print something, they will select their picture icon on the printer touch screen and then enter their password. This will then unlock the printer and allow them to print, copy, or scan. Every interaction is kept in an Activity Log that can be access by the Administrator. This can help with analysing which departments are printing the most and whether any restrictions need to be placed in order to minimise printing costs. Another common security management option that will be familiar to anyone with a credit card is the PIN code system. A PIN, or Personal Identification Number, is typically a four to six digit number that a person chooses to secure an account. This should be a number that is easy to remember for themselves but hard for others to guess. Most people will be used to this kind of set up if they have ever had a credit or debit card, which use PIN codes to secure access to people’s finances. Utilizing a PIN access management system on your printer works in much the same way. Each user will select a PIN code and the Administrator will attach that to their accounts. Whenever they wish to print, they simply enter their PIN and the printer will recognise who is printing. This is an easy and familiar way to manage access to your office printer, without requiring your employees to learn a complicated new process. Another common method for monitoring access to your office printer is utilising a username and password system. Similar to the PIN system, the username and password method will be very familiar to anyone that has ever had any kind of digital account. Each user will select a username, often their email or their surnames, and then a password that will be tied to the account. This option is potentially the most time consuming, as each user will need to enter both a username and a password, as opposed to selecting an icon or entering a simple PIN. However, it is also potentially more secure, as it requires two separate identifying pieces of information to be entered. Another way that office administrators can manage their printer access is through the installation of card reader technology. This process involves installing a card reader attachment to your printer. 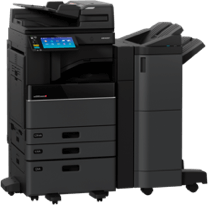 Many big brands such as Canon, Toshiba, and Konica Minolta, all have card reading tech available for their multifunction printers and copiers. Installation is relatively straight forward, and your technician can walk you through how to set up each card. Once your card reader is installed, you would activate each card and then attach a specific user to each card. Then, whenever a user wants to use the printer, they would simply touch their card to the reader and the printer would automatically log them into their accounts complete with all their personalised settings and apps. This is the fastest option, as it requires a simple motion to unlock the printer and doesn’t require anything to be memorised. However, it does require each of your authorised employees to carry around a physical card, which always opens up the possibility of one getting lost. Which particular method you choose will depend on your office, how many employees you are managing, and what kind of printer you currently have. Any access management is better than no access management, so whichever method you choose you are bound to realise the inventory and time savings eventually. Are you looking for a new printer for your office that can provide you with integrated access management solutions? 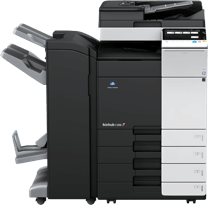 Busys.ca offers a range of high end multifunction printers and copiers from industry leading brands such as Toshiba, Canon, and Konica Minolta. Contact us today and one of our printing experts will help you choose a machine that is perfect for you.